May was an exciting month for the Amtrak History team; in addition to celebrating National Train Day, we were invited to create a display for the Museum of Transportation—St. Louis (MOT). Located on a campus west of the city, the MOT is recognized as one of the largest and best collections of transportation vehicles in the world. Since 1944, the museum has striven to be the leader in protecting and interpreting North America's transportation heritage. The top shelf shows images of the company in its early years. The museum complex includes one of the first man-made railroad tunnels (no longer in operation) west of the Mississippi River, four miles of switching and exhibition track and 10 buildings housing transportation-related memorabilia and documents. The railroad enthusiast will find more than 70 locomotives on display, and there are also extensive collections of automobiles, buses, streetcars, aircraft, horse-drawn vehicles and riverboat materials. Young children flock to “Creation Station,” a hands-on learning environment that introduces them to all modes of transportation while developing learning skills. The menu on the left features the famous Gateway Arch. 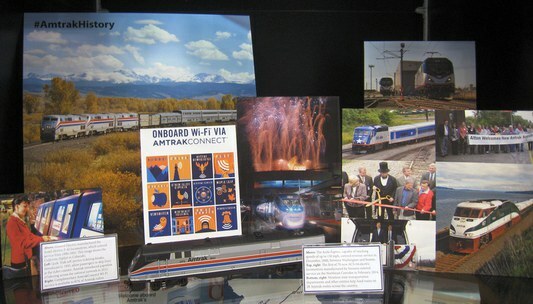 Located in the William R. and Laura Rand Orthwein Education & Visitor Center, the Amtrak history display traces our more than four decades as America’s intercity passenger rail operator, primarily through archival images and select memorabilia. Some pieces, such as a lunch menu with the Gateway Arch, were chosen for their local connections. Visitors to our traveling Amtrak Exhibit Train always admire David Klein’s colorful posters; therefore, we had to include one on the top shelf—its bright colors and engaging patterns catch the eye. Proceeding chronologically, photos explore employee uniforms, rolling stock, technological advances such as the computerized reservations system and the introduction of customer amenities including AmtrakConnect Wi-Fi. This shelf highlights state partnerships, customer amenities and new initiatives including AmtrakConnect Wi-Fi. Below: Celebrating the Amtrak-Missouri partnership. Also highlighted are Amtrak’s partnerships with 19 state transportation departments and other entities that help fund trains on 28 passenger routes across the country, including the Piedmont Service (Charlotte-Raleigh) in North Carolina and the Lincoln Service (St. Louis-Chicago) in Illinois. 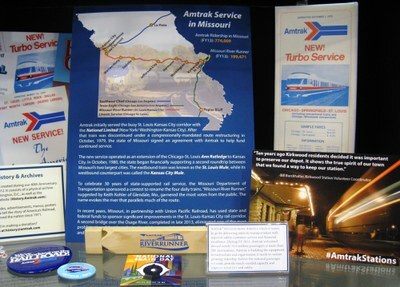 One shelf is devoted to the long-standing Amtrak-Missouri partnership, which was established in 1979 as a result of the discontinuance of the National Limited (New York/ Washington-Kansas City). Without that train, the busy St. Louis-Kansas City corridor would have had no passenger rail service; thus, Missouri signed an agreement with Amtrak to help fund continued service. To mark the 30th anniversary of the partnership in 2009, the trains were collectively renamed the Missouri River Runner through a public contest. If you are in the St. Louis area in the course of the next year, stop by the Museum of Transportation to check out the display! We’d love to hear your feedback in the comments section below, or take a photo of the display to share on social media with the #AmtrakHistory hashtag.